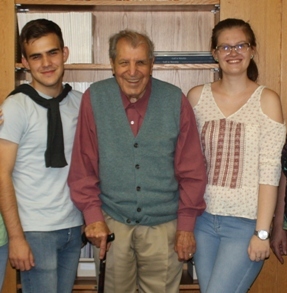 The Worldwide Ministries Team of Lehigh Presbytery has brought two young adults from our partner districts of the Hungarian Reformed Church in Romania to the United States for a cross cultural experience. Istvan Jakab is a young man from the Transylvania District of the Hungarian Reformed Church in Romania. He is currently a university student at the Babes-Bolyai Unitersity in Cluj, Romania, studying mathematics and computer science. He speaks Hungarian, Romanian, English, German and Dutch. He enjoys playing the violin, guitar and piano. Zita Salanki is a young woman from the Oradea District of the Hungarian Reformed Church in Romania. She is currently a university student at the Medical University of Debrecen studying dentistry. She speaks Hungarian, Romanian, and English. She enjoys dancing, Zumba, and reading. Both interns will be helping the camp counselors at Kirkwood Camp the week of July 30- August 4, 2017 and August 6-11, 2017. They will be staying with host families on the weekends. They have come to share their culture and faith with the camp youth, camp counselors, their host families, and churches they visit. The Worldwide Ministries Team of Lehigh Presbytery has facilitated these global intern exchanges since 1998, the year after entering into a partnership with the Hungarian Reformed Church in the Transylvania District. We are excited to have these young adults with us. We hope you can make time to meet them while they are here. They will be staying with host families from the College Hill, First Easton, and First Allentown churches.